Ever wonder how real estate magnates become real estate magnates? Not by filling out mind-numbing mortgage applications! For years, successful real estate investors have used creative money strategies that circumvent banks, yet result in profitable deals. Real estate professional James Misko makes these innovative techniques available to the general public in How to Finance Any Real Estate, Any Place, Any Time. This easy-to-use guide offers more than forty-five nontraditional ways to buy properties. You will learn how to turn your dwindling stocks into real estate equities, how to acquire land without money, and so much more. If the only thing holding you back from buying your dream house or investment property is financing, maybe it’s time to buy “outside the box” with How to Finance Any Real Estate, Any Place, Any Time. nWhat IRA Transactions Are Prohibited? The strategies I am about to explain will guide you in buying, selling, and exchanging real estate in ways that have probably never occurred to you, and that are known to very few people. The fact is that you truly can finance virtually any real estate, any place, any time. This book will show you how it’s done. For over three decades, I have been a highly successful real estate professional. I have helped my clients finance investments in ways they never dreamed were possible, and have watched them build their real estate portfolios and enjoy their gains. And I have built up my own portfolio along the way. At first, I relied on conventional financing techniques, turning to banks and credit unions for the loans needed to complete transactions. But, as I soon learned, conventional financing isn’t always available. Sometimes conventional lenders don’t like the property being acquired. Sometimes they don’t trust the borrower. And sometimes, while they’re willing to provide the financing, they simply can’t provide the level of financing needed by the buyer if he is to both purchase the property and make the necessary improvements. Fortunately, along the way, I also learned that there are a wealth of financing methods that can be used when regular financing channels are not available or not adequate. And each of these methods allows both parties—buyer and seller—to come out a winner. In fact, I discovered that this is one of the keys to successfully financing real estate deals. Every party in every transaction is looking for certain benefits. You know what you want—perhaps a home, an income-producing property, or a tax shelter. But what does the seller want? Immediate cash? A steady monthly income? A piece of property that better meets his investment needs? Figure out the benefits that each party is looking for, and you’ll be able to choose a strategy that allows you to get the property you want. How to Finance Any Real Estate, Any Place, Any Time presents forty-seven strategies, each of which either circumvents standard financing channels, or enables you to convince hesitant traditional lenders to supply the financing you require. Need time to acquire financing for a prime piece of income-producing real estate? Try securing the property with an option while you arrange for the loan. Have cash for only a small down payment, while the seller wants the security of a large down payment? Use collateral security—personal property such as automobiles, boats, or stocks and bonds—to provide the seller with the level of comfort he needs. Don’t have cash available to cover the closing costs? Use notes or other real estate-backed paper instead. Can’t afford that great property you need to house your new business? Buy only the building, and lease the land on which it’s sited. Other topics include using a blanket mortgage or wraparound mortgage to obtain financing, forming a syndication, using zero coupon bonds and certificates of deposit to secure a loan, and much much more. All strategies are tried and true, and can be used to finance a variety of investments, from a personal residence to a modest apartment house to a sprawling retail shopping center. While it’s usually a lack of financing that stands between you and the property you want, I’ve learned that sometimes other problems exist. In cases in which the owner finances the purchase, sellers sometimes fear that if the buyer’s income were to stop because of death, illness, or accident, the monthly mortgage payments might stop as well. In situations in which property is traded, some sellers are uncomfortable trading their property for real estate that has a second mortgage on it. 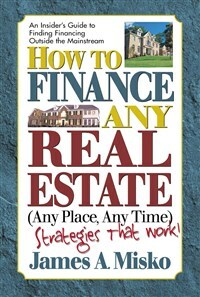 That’s why this book also includes a number of deal-making strategies—techniques that can be used when an obstacle other than financing stands between you and the property you want. You’ll find that there are many proven ways to give the seller the benefits he’s looking for, often without spending an extra dime on the investment. Whether concerned with financing or deal-making, every strategy in this book is set up for maximum clarity. After a brief introduction, each first provides a “Strategy” section that presents clear step-by-step instructions for using that financing or deal-making technique. Following this, a scenario provides a true-life example, showing the strategy in action. Throughout, techniques are explained in easy-to-understand language, and definitions are provided as necessary. For further help, though, you can turn to the Glossary on page 167. Other helpful sections include a Resource List (page 181), which will guide you to groups and web­sites that can provide further information on real estate investments; a list of Selected IRA Trustees and Custodians (page 187), which will come in handy if you decide to use funds from your Individual Retirement Account to purchase real estate; and The Internal Revenue Service Code on Property Exchanges (page 189), which presents the rules for trading properties without paying capital gains tax. And throughout the book, insets present helpful information on tax strategies, owner financing, options, notes, syndication, due diligence, and many other important topics. Before you start scanning How to Finance, looking for the best strategies for your real estate investments, a word should be said about the need to work with a team of qualified professionals. You probably already know that even the simplest transaction, such as the purchase of a home with the assistance of a bank loan, necessitates the use of an attorney. As you get involved in more complicated transactions, such as the trading of one property for another or the use of options and syndications, the need for truly qualified professionals will only increase. So if you haven’t al­ready found an experienced real estate attorney, accountant, and escrow closer, by all means, start your search. Advise all candidates that you will be using some less-than-conventional means of financing your purchases—strategies that are most certainly legal, but do not always involve conventional lenders. If the candidate tells you that it simply can’t be done, walk away and look for someone else. Don’t worry. There are plenty of good people out there who are ready, willing, and able to think “outside the box” and help you acquire the real estate you want. Everyone has long appreciated the security provided by wise real estate investments. And if anyone needed a reminder, the recent sharp decline in the stock market certainly provided it! Unlike a stock, a piece of land can never totally lose its value. It simply won’t cease to exist like so many dot-com companies did a few years back. The problem is that when a great real estate investment presents itself, you don’t always have the resources available to seize the moment and make that property part of your growing portfolio. But as I have learned over the last thirty years, usually resources are in fact available. You just have to understand how to identify and use them. With How to Finance Any Real Estate, Any Place, Any Time, you will know how to put the wraps on virtually any real estate purchase—even when financing seems impossible. See you in escrow.